US, 1939, 81 minutes, Black and white. John Wayne, Claire Trevor, George Sanders, Brian Donlevy. 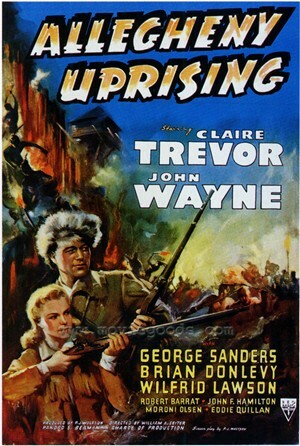 Allegheny Uprising is a John Wayne western. It appeared later in the year from Stagecoach which transformed John Wayne's career from small budget westerns to big budgets. He is teamed with Claire Trevor again. George Sanders is the British commander and Brian Donlevy and the villain. It is routine material - though of interest showing the settlers combating the British years before the War of Independence. 1. Entertaining western? Small budget, brief? Pennsylvania, the Indians, the British? 2. Black and white photography, John Wayne as Star? The rest of the cast? Action sequences? 3. Jim Smith, his skills as an Indian tracker, the experienced with the Indians, the Professor? Not romantic - and the clashes with Janie? the clash with Captain Swanson? His arresting them, letting them go? The clashes with Trader Calendar? The disguise as Indians, destroying the supplies, the clash with Swanson, the siege of the fort? The fresh charge of murder, the court case, Jim being released? Re-united with Janie and off to Tennessee? The Hollywood happy ending? 4. The Pennsylvanians, Jim and the professor, working with the Indians, captured and becoming brothers with them? The clash with the English? Suspicions of the trader supplying the Indians with liquor and firearms? Their coping with the English, the disguise as Indians to confront the trader? The build-up to the war of Independence? 5. Janie, the attraction to Jim, his absence with the Indians? The courtship, her antagonism, disguising herself as an Indian coming with the men? The English? The court case and the happy reunion? 6. Captain Swanson, the arrogant Englishman, the British soldiers and the garrison, the protecting of the settlers, the scouts, the Indians? Trader Calender and his deals? Deception of the British? Suspicions of Jim Smith and the professor? The relationship with the Governor? The siege, the clashes, the court case? Swanson and his having to return to England? 7. Trader Calender, the villain, supplying the Indians, deceiving the British, the clash with Smith and the Pennsylvanians, the murder, his testimony in the court? The disproving of his testimony? 8. A picture of the early Americans, the changes in the 18th century, the Americans and the Indian's, the Americans and the British?